Two applicants in a row said they didn't know until recently that their properties had restrictions on them, and even staff seemed confused about at least one of them. Maybe there's something wrong with how the county makes that information available to purchasers of property? Almost nobody attended the Greater Lowndes Planning Commission meeting of 25 February 2013, as you can see from these videos. Here's the agenda. And here's a summary of the cases. They want two pet thoroughbred horses on the property. Nobody spoke against. Applicant spoke for, saying the property was purchased by his mother, who is currently in Iraq, and they had been under the impression it was already zoned agricultural. When they discovered it wasn't, they applied to change it. Animal Health Fair flyer seen on the door of the Lowndes County Commission Chambers yesterday evening at their 5:30 PM Regular Session. Valdosta, Lowndes County, Georgia, 23 October 2012. On November 3rd the animal shelter along with the Humane Society will have the first animal health fair here in Lowndes County. It's hoped that this is going to be an annual event, held the first Saturday of November. And the purpose is to mirror the benefits you see for people health fairs. Here's a single video of this morning's entire Lowndes County Commission Work Session. The railroad item was neither of the ones on which I was speculating. The animal shelter wants a 24 hour "cooling-off period" with a submitted animal kept at home before "evaluation" by the shelter. The Tax Commissioner wants to refund some taxes they apparently accidentally overcharged. The Fire Chief has bids for equipment for the new fire truck. And there's going to be an animal health fair. They vote tomorrow evening at 5PM. Here's the video, followed by the agenda, with links to the relevant parts of the video, and a few notes. Some of an animal shelter story coming out in Chatham County sounds familiar. Mary Landers wrote for SavannahNow 20 October 2012, Savannah Chatham Animal Control Shelter cited for violating state rules: Local professionals call shelter's care "inhumane"
The county-funded Savannah Chatham Animal Control Shelter was found to have repeatedly violated animal protection requirements in two state inspections last month, and its practices are being criticized as inhumane by four local animal professionals. One professional criticized the shelter not only in writing, but also by revoking the shelter's permission to use her veterinary license. The Chatham County Commission says it's dealt with the problem. We'll see. Five minutes? Or will they discuss any of the four items on the agenda for Monday morning's Work Session? What's the CSX project? Is it this item from the T-SPLOST constrained project list? The Commission could just post the proposed agreement along with the agenda, and then we'd all know. Why are Commissioners hiding behind Joe Pritchard, instead of discussing trash disposal in open meetings? At last week's Regular Session of the Lowndes County Commission, County Manager Joe Pritchard repeated part of what he said the previous morning at the Work Session. After the meeting he came up to me to ask whether he had clarified it more. I do appreciate him doing that, and he did clarify where the new cards are on sale, although he omitted any mention of where they had been discussed previously. And it's true that the previous morning he did not say anything had been decided. Yet the method of paying for waste disposal has changed (for only six months, and not prorated), so somebody decided that, somewhere where the public was not invited. That six month period conveniently ends just after the current current Commission will be replaced by a new Commission with two additional members and a new Chairman. Those of us who remember former Chairman Rod Casey's Commission passing a waste collection plan just as he left the Commission may remain sceptical that the Commissioners haven't already made up their minds to privatize trash collection and socialize the losses onto landowners, who will have to deal with increased illegal dumping. How can a man with health care financial troubles make a living with a shop he's had for decades when some of the neighbors complain about a rezoning that is now required? 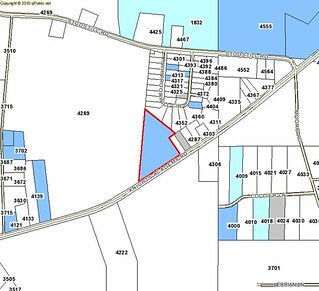 A controversial case that raised issues ranging from wetlands to public safety to Moody Air Force Base jets flying out of Valdosta Airport made its way through two appointed boards to a Solomonic rezoning decision by the elected Lowndes County Commission. Nobody wanted to deny a man a living, but many people wanted to limit potential commercial uses of the subject property. The Commissioners attempted to take all that into account, yet failed to incorporate two major considerations raised by neighbors, mentioning one of them only to disparage it. Even that isn't the end of it, since it may head back to the Zoning Board of Appeals for a buffer variance. Here are videos of REZ-2012-09 Copeland at the Lowndes County Commission. It had been to the Planning Commission for a recommendation on rezoning, it had been to the Zoning Board of Appeals for a buffer variance, Monday morning it had been to the County Commission Work Session at which we learned a bit more, and Tuesday evening it went to the Lowndes County Commission Regular Session for a vote on rezoning. At the 8:30 AM Monday Work Session, County Planner Jason Davenport had several updates since Commissioners had received their packets the previous week. An email from a Mr. Bradford in opposition. Some open records requests to be filled after the work session. Davenport had met with the applicant, Mr. Copeland, who had provided more materials because he believed there were some accusations about lack of continuous operations in the building. Those not supporting the case. He said one possibility would be for he and the county attorney to meet with the opposition attorney to try to work out some conditions. Here's a list of every citizen speaking for, at any of GLPC, ZBOA, or County Commission: John A. Copeland (the applicant), Kevin Copeland (applicant's son), Nancy Hobby, Charles Miles, Fuller Sorrell, Alan Davis, Robert Roffe, and Norman Bush, plus a petition for. Here's a list of every citizen speaking against, at any of GLPC, ZBOA, or County Commission: Bill Nijem (attorney for several neighbors), Jimmy Hiers, Gail Hiers, Greta Vargas, and Patty Haynes. Chairman Ashley Paulk announced the hearing.